“Priceless”! Well! All I know is this: when I was a small boy growing up in Michigan, I had sweatingly vowed to myself never to let Audrey Niffenegger outdo me in any way. So far, I’m pretty sure I’ve made good on that vow. I mean, The Order of Odd-Fish has sold about 12,000 copies. I don’t know how much more a “bestseller” sells, but it can’t be that much more, right? ANYWAY, EVERYBODY KNOWS IT’S JUST A BIG POPULARITY CONTEST, I DIDN’T EVEN WANT TO BE ON PROM COURT, I’D RATHER HANG OUT WITH MY “REAL” FRIENDS ANYWAY, SO STOP BEING SO IMMATURE ABOUT IT, AUDREY. On the drive over to Margie’s Candies, though, Brandon and I realized that my meticulous Niffenegger research had one crucial shortfall: I’d never heard Audrey Niffenegger speak, nor did I know anything about her personality. We hastily brainstormed and decided Ms. Niffenegger had a personal grudge against Eric Bana (who’d starred in the movie adaptation of The Time-Traveler’s Wife). We planned to somehow bring every conversation back around Audrey Niffenegger’s obsessive complaint that Eric Bana is “not being very believable as a time traveler” in various other time-travel movies (after all, he played a time-traveling Romulan in the Star Trek reboot, too—Jesus, Eric Bana! Is it possible for you to make a single movie that isn’t about time-traveling!). We got to Margie’s Candies and sat down. It seemed Laura (our auction winner) was late. But then it turned out that she and her friend Jayne (whom she brought as backup) were there, but they were ignoring us—they were a little apprehensive about meeting a half-assed drag queen and the Unabomber. When we finally talked to Laura, she seemed pretty gobsmacked at first, but she later got into the spirit of it. We had a delightful conversation—an “enchanting evening,” if I may be so bold—over ice cream sundaes. It turns out, Laura admitted, “I did not do any research or read up on you and the experience.” Have you even read The Time-Traveler’s Wife? “No.” Wait, so did you realize the basic premise of this evening was that you’d be meeting a fake Audrey Niffenegger in drag? “Er, no.” Awkward! 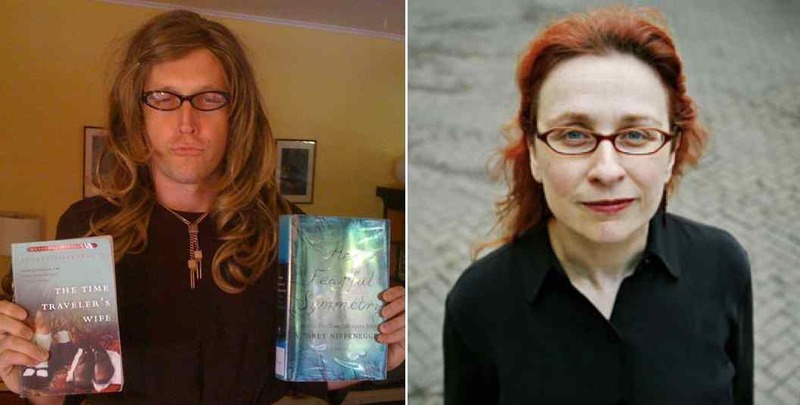 Thanks, Laura, for contributing to the Evanston Public Library, and tolerating our tedious hijinks; thanks Seth Dodson for the wig, glasses, shoes and unmentionables; thanks to Brandon Will for accompanying me; and thanks to Audrey Niffenegger for being a good sport. I mean, I assume she’ll be a good sport. I imagine that being obnoxiously impersonated by an obscure fantasy author must be nothing but gratifying.